I should start off my telling you exactly what Cupcake Project said in her post: These cupcakes "are not diet food. They have a buttery crust topped with a buttery, salty, popcorny, gooey topping, and they are finished with sticky, sweet caramel corn." That being said, they sound delicious! 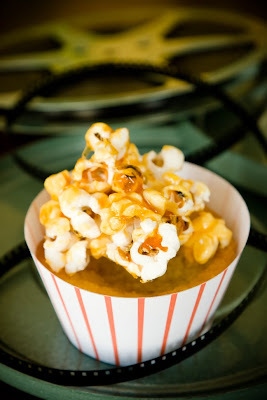 These cupcakes are made with an ingredient I've never even heard of: popcorn flour. But don't worry, if you can't find popcorn flour in your nearest grocery store, Cupcake Project tells you how to make it yourself. You can find the full recipe on Cupcake Project's website. I'm sure a wheat grinder would work!